Green Oil started with a sample batch in 2007 when the Tour de France started in Trafalgar Square, London. Empty bottles purchased through Ebay, bottles filled through a reclaimed beer tap and labels designed in Microsoft Word, printed onto paper and applied with glue. We've come a long way since, check out how our branding has changed, and the range grown. Wax lubes dry to leave a semi-dry waxy film on your chain. 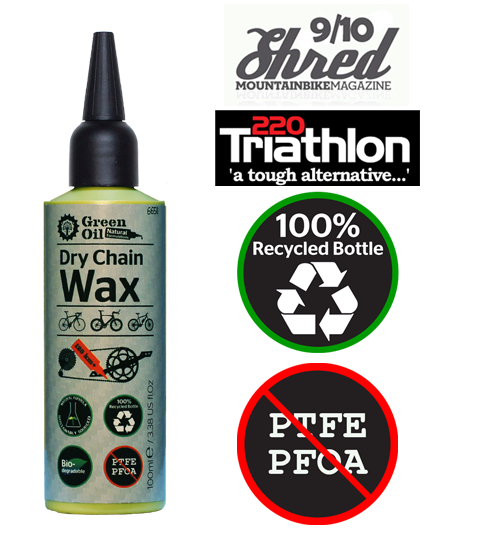 Wax lubes are great as they attract less dirt, especially good for very dry dusty trails. Many wax lubes contain PTFE, which makes a carcinogen when it's made. PTFE doesn't biodegrade. We use natural waxes instead of paraffin wax, and a plant based solvent from sugar grown here in the European Union. Ideal for touring, it's also re-fillable. Small enough for your pocket or a saddle bag. The new bottle is made from recycled plastic, and can be re-filled with 30ml of your favorite lube. - Now fits most most grease guns. Mechanics regularly work with grease. They get it on their hands. It's morally wrong that other brands use petrochemicals and PTFE. PTFE makes a carcinogen when it's made, accumulates in body tissue and the environment. CF3 is now a limited edition product. 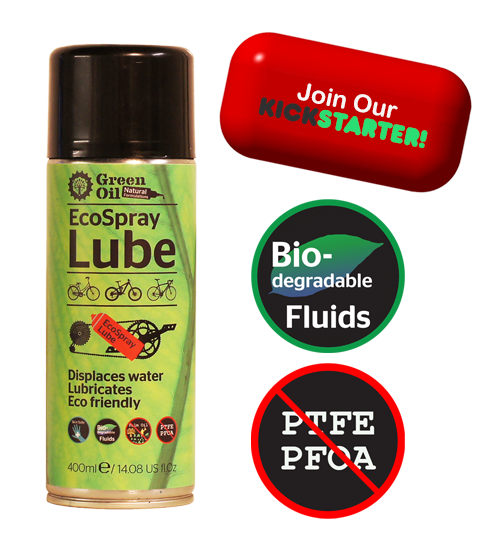 A company making one of the essential parts stopped making it - so CF3 has now been replaced by EcoSpray lube below. Released in April/ May 2017, we secured funding to produce this product through Kickstarter. See more by clicking below. Carbon fibre safe, easy to use. Some bike cleaners use nanotechnology and are not good for the environment. Green Clean comes with a 300ml concentrate inside, you add the water when you get it home. This means a lower carbon footprint - most cleaners are over 90% water anyway. Clean Chain degreaser makes chain cleaning easy! Put it on your chain. Spin the cranks for a few seconds. Rub it off with a dry rag, then repeat with a wet rag or brush. Then rinse. One bottle does 7 - 10 chains. - Built to last OVER 10 years! Fed up of plastic brushes made in China? This was inspired by a cheap plastic brush that had spikes for a handle which digs into soft wet fingers. The plastic bristles also clogged up. 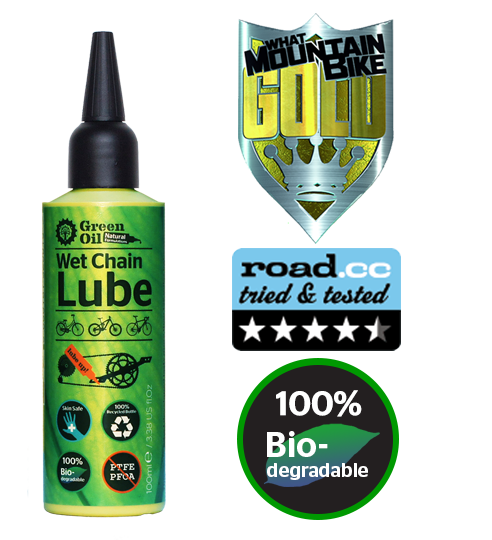 The Green Oil Ergonomic Drive Chain and Bicycle Brush is different. This brush is luxurious, it's made in the UK and even the print on the handle is biodegradable. It's designed to last more than ten years. The wood is FSC certified - we're not destroying rainforest to make it. The bristles are tough - you can scrub a chain really heard - they won't wear out or fall out quickly. Grime doesn't stick to them easily. It works. Also the World's first bicycle product with FSC certification - a stamp of approval from the Forest Stewardship Council. - Sadly the Philippines based company who made this with us disappeared. 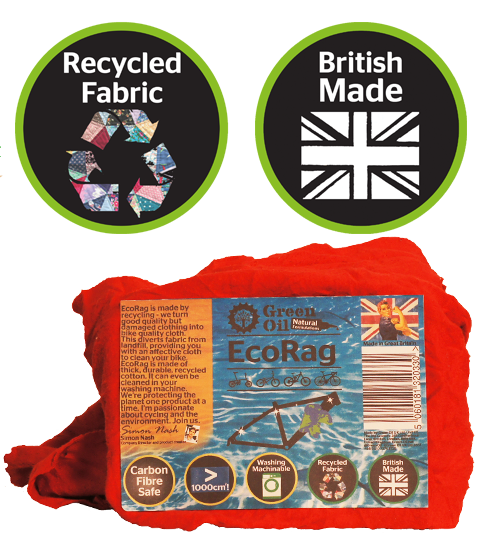 EcoSponge is now replaced by EcoRag which is made in the United Kingdom. - Makes the grimiest chains with several layers of oil and mud shiny within 5 minutes. - Re-usable more than 3 time. Incredibly powerful. Some 'orange peel' degreasers use petroleum. Agent Apple doesn't. It's strong, and re-usable too. Place your chain, cassette or other metal part in a half milk bottle, pour in the Agent Apple and it will start eating away the grime within 5 minutes. A light brush with a toothbrush will shift any grime previously stuck on. The Eco Rider Deluxe set tub is made from recycled plastic. However, in the UK, it's difficult to recycle this type of plastic (type 5, 'polypropylene'). Therefore, the Green Oil Eco Rider Deluxe set includes a pack of seeds - you can grow your own salad or herbs to give the tub a second life! It's also great for storing the products neatly in your garage. Make sure they're dry first though.